As we saw with the rapid fall of the Soviet Union and the end of the Cold War, history can change on a dime with little warning. Russia's latest row with Ukraine is a good reason to tilt the prism we look at thing through and ponder a few items. No one knows the Russians better than the Eastern Europeans who were once part of the Soviet Block. When they rapidly moved away from Communism and joined NATO, they rightfully had a unique challenge in building sustainable economies and representative governments in line with the Western European standard +/-. They all minimized what, under the protection of NATO and the supine wreckage of Russia to the east, was a lower priority - military spending. The end of the 2nd decade of the 21st Century is not the 1990s and the last few years have seen a return to historical norms - the Russian bear looming to the east. Of note, to a nation, all the former Warsaw Pact and Soviet Republics now in NATO have significantly increased military spending since 2014 when it was at its lowest. They skimped too much in the face of a growing Russia and are playing catch-up as best they can. Is it fast enough? TBD. Hopefully, apart from internal realization of their shortcomings and pressure from the alliance partners, investment in defense in Eastern Europe will continue. Russians respect power more than anything, and a strong Eastern Front of NATO is best for all. I also hope there is something else driving this; a realization that NATO is not a guarantee. Many are now taking seriously what I have been warning my European friends for two decades; the USA is one election away from leaving Europe to its own devices (see the Norwegian series, Occupied - it ain't just me who sees this, and it pre-dates Trump). What are those nations on the front lines against Russia doing for their own security? What alone, or in some collective, what can they put against the power of Russia? People and nations will show you what they think is important based on what they spend their money one. Last night I put a few numbers together. There is so much potential here even without any help further west. Their population is not quite Russia, but it is their economic power that is the key. Of course the weakest part of this is their lack of unified command - something they have in NATO - but with perhaps the Visegrad as the anchor - why not have some military structure in place like most of Western European NATO have with the EU military structure? Not a counter to NATO, but a backup - just like in hushed voices, some on the EU military staff will tell you. It would be a staff in being, waiting for a reason to scale up. First things first though. 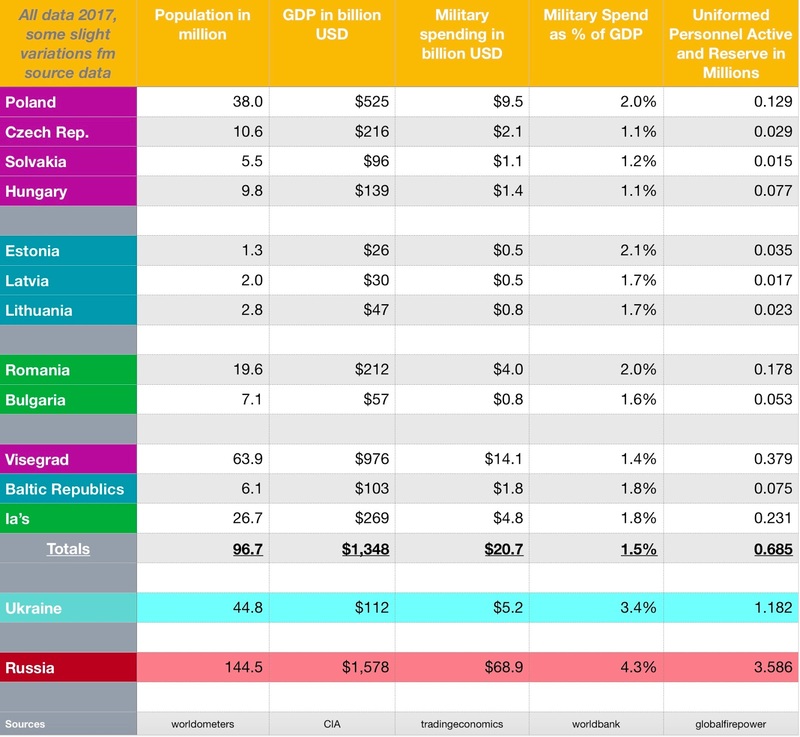 The great advantage Eastern European NATO has against the Russians - especially Poland and the Czech Republic, is the strength of their GDP/person. They have strong economies. If they are smart, even small increases in military spending can buy quality kit and training - quickly closing the gap with Russia. A strong Eastern Europe, economically, militarily and rule of law, would be the best guarantor of containing Russia. A promising side effect, by example and close ties, a rising Eastern Europe will help their neighbors, Ukraine and Moldova, start to improve as well. Eastern Europe does not have to think that Germany, France, Britain, or the USA are the only things keeping Russia away - if they invest and think - they can do most of it all themselves. With strong backing to the west, even more. Remember, Eastern Europe has no threat from the west while Russia has much to concern her to her east. If Russia wanted to move west, she could not bring her full force to that effort. Eastern Europe however can put their full force facing east. Ponder 3-4 moves ahead of where we are at the close of 2018.